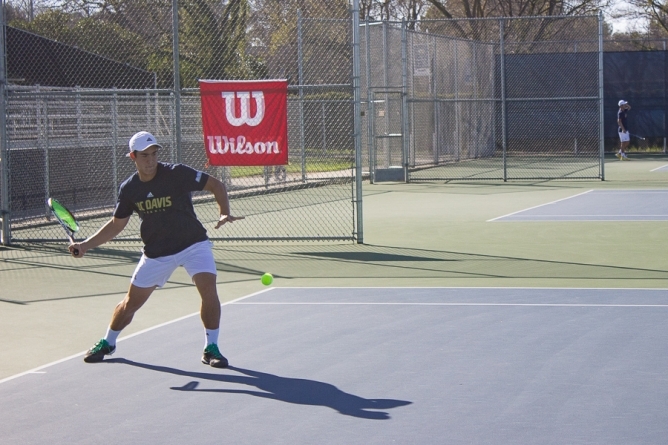 The UC Davis men’s tennis team hosted a double-header on Saturday in which it came out victorious in both matches, compiling a win against the University of Nevada, Reno with a score of 4-3, and against Sonoma State University by a 5-2 margin. UC Davis’ women’s tennis team fought hard but ultimately lost a close, 4-3 match to the University of San Francisco. In the men’s team’s early match against Nevada, junior David Goulak and freshman Nil Giraldez each won their singles matches in straight sets to help catapult the Aggies to their sixth consecutive victory to start the season. The Aggies lost two seniors to graduation last year, Tommy Lam and Everett Maltby. Giraldez showed resilience with his defensive style of play. Early in his singles match, he lost his serve and found himself down 4-1. After some adjustments, he came back to win the set and match, 6-4, 6-4. Coming from Spain, where tennis is played more on clay courts, Giraldez has been forced to change up his style to adjust to the faster-paced, hard court game.The ball bounces higher and slower on a clay court as opposed to hard courts, the primary type of court in the U.S. The slim 4-3 victory in the first match did not slow down the Aggies heading into their later match against Sonoma State. They again took the doubles point and this time cruised to take four of the six singles matches. The 5-2 team win was highlighted by another straight set singles triumph for Giraldez and straight set wins for sophomores Daniel Landa and Dariush Jalali. In the women’s lone match of the day, things were much closer. The Aggies were able to secure the double’s point, but were met with stiff resistance from the Dons in singles play. Junior Nikita Pradeep notched a straight set win at the singles one spot to put the Aggies in front 3-1, but USF was able to win at both the two and the four spots to even the match at three apiece. This set up a showdown at the three spot, with senior Isabella von Ebbe acting as the Aggies’ deciding factor. After an intense final set in which both players were able to break the opponents’ serve, USF’s senior Margarita Treyes took the final set, 6-3. This was the women’s third straight loss to open the season. Two Aggies, Von Ebbe and junior Kristina Breisacher, are reportedly playing through injuries. “Considering that we have our three and four injured, I think we still have a pretty good season ahead of us,” said sophomore Shirley Hall. Men’s tennis will travel to Southern California to play the University of Southern California and International Hope on Friday. Women’s tennis will travel to the South Bay to play Stanford on Saturday and Santa Clara University on Sunday.